This spotlight is on Justine Konicki, Associate at Kohrman Jackson & Krantz LLP. 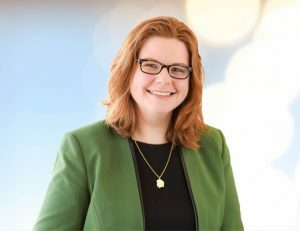 Much of Justine’s current legal work focuses on real estate law and the representation of borrowers, lenders, developers and tenants in a wide variety of business and commercial litigation. She also frequently works on behalf of individuals, middle-market and small businesses in such matters as contract and shareholder disputes. What are the biggest hurdles you encounter when working with your clients and educating them on the eDiscovery process? What can they start doing now to help streamline everything you need from them? I do not face many hurdles when dealing with clients and eDiscovery. I communicate early and often concerning the process and why the discovery is needed and then I work directly with them in implementing the best procedures to capture information that will be turned over in litigation. However, that does not mean that clients have not ended up in situations where they are forced to incur needless cost and expense in producing electronically stored information. I find this most often occurs when businesses have recently changed operating systems or servers and not kept recent data in useable forms or where they have not implemented and followed clear document retention policies. By implementing document retention policies, businesses can ensure they are not overly burdened by unreasonable discovery demands and keep the costs associated with e-discovery under control. I’m sure a day doesn’t go by without hearing the word “metadata”. How helpful is it to know specific details about a document when you review it? Depending on the facts and circumstances of a case, metadata can be the highest and best piece of evidence or it can be superfluous. In my practice, obtaining electronically stored information, with metadata intact, has been crucial in proving theft and alteration of documents, especially in high-stakes misappropriation of trade secrets or “bet the business” litigation. But in more straightforward business disputes, metadata may not be crucial. In this regard, attorneys should be conducting early assessments of the case’s discovery needs and should obtain agreement among all parties as to the scope and requirements of discovery. When attorneys engage in early assessment and obtain agreement as to the scope of discovery, clients can avoid the sometimes high costs associated with producing native files, with metadata intact, and still comply with all discovery requirements. There’s been a lot of debate on whether it’s better to insource eDiscovery or outsource it. How does your firm address this and what has been your experience with this decision? The scope, nature and duration of discovery is different in every case and there is no “one size fits all” approach. KJK strives to meet the needs of each case and client, while always striving to be cost conscious. Accordingly, KJK will insource or outsource eDiscovery based on those needs and has found both methods to be effective. How have the changes to the Federal Rules of Civil Procedure, most significantly the change to FRCP 26 (b)(1), affected the way you address eDiscovery. What are you seeing from Opposing Counsel? On December 1, 2015, significant chances to Fed. R. Civ. P. 26(b)(1) went into effect, which amends the rule governing the scope of discovery allowed in federal cases. The changes are intended to curtail attorneys’ reliance on the ill-defined standard of “likely to lead to the discovery of admissible evidence” and instead require the parties to look to the relevancy of the information sough and to determine whether that discovery is “proportional” to the needs of the case. Factors to consider include the amount at stake, the parties’ resources and access to information, and whether the burden or expense of discovery is outweighed by its likely benefit. In this regard, evaluation of eDiscovery needs is basically mandatory and, as a result, I have seen more willingness from opposing counsel to discuss and agree to the scope, nature and extent of discovery early in litigation. Cyber Security has been the latest buzz word in the industry for a while now. How are your clients/law firm addressing this major area of concern and where do you see this going? Clients and businesses are rightly concerned about cyber security. As our reliance on technology increases, so do the risks. KJK strives to be on the forefront of counseling on cyber security threats and conducts a robust cyber-security review as part of its business legal assessment program. KJK also actively counsels clients on cyber security response plans, procedures and how to handle a data breach. KJK also works with clients on: policies and best practices relating to cyber threats, including insurance planning; policies on the collection and use of personally identifiable information; review of payment and procurement policies for cyber law risks; and review of standard terms and conditions with warranties and indemnification provisions that may, in part, protect from cyber law risks. And, when clients are faced with the worst-case scenario, KJK litigates data security breach actions. If you liked this blog article, you might want to check out our eDiscovery Spotlight Featuring Jennifer Dowdell-Armstrong, McDonald Hopkins, LLC.